It’s idealistic to believe that a family will sit down to dinner and share a nutritionally balanced meal with lively conversation each and every night of the week. The demands of modern life and the mobility of kids and partners means that more frequently, dinner is eaten in shifts. My husband is a lousy cook and his only interest in food is eating so when either of us has a late afternoon or evening commitments it falls to me to get myself organised and prepare a dish that can be made in individual serves and will not suffer being held over and/or reheated. In summer it’s always a salad, but the cooler months are upon us I prefer to have a more substantial dish, something warming. We’re all over the place at meal times this week, so long neglected moussaka was my dinner of choice. It fell below the radar because our eating habits changed enormously when we relocated to Brisbane, oven baked food took a step backward but it’s good to revisit the moreish flavours of savoury lamb mince, grilled eggplant, zucchini and cheesy bechamel, all melded together. Constructed and baked entirely the day before, this moussaka suffers no degradation in flavour quality or enjoyment after being reheated in the microwave. A crisp green salad dressed simply with extra virgin olive oil and a squeeze of lemon juice was the perfect accompaniment. I’ve based this recipe on Maggie’s Beer’s Lamb Moussaka recipe from “Maggie’s Kitchen.” I’ve embellished it with extra vegetables recommended by my friend Paula in her moussaka recipe and made a few minor adjustments to suit my diet and pantry. You’ll find a delicious vegetable moussaka recipe on my blog too. I posted that quite a while ago. 2 medium sized waxy potatoes cut into 1.5cm slices and steamed. Preheat the oven to 180C. Lightly oil 4 large ovenproof ramekins of 2 cup capacity. Heat a saute pan, add the olive oil then crumble the lamb mince into the pan. Add the ground cinnamon and tomato paste then saute the lamb until golden. Pour off any excess fat. Add the garlic infused oil, tomato puree, stock and lemon thyme . Bring the pan to a high simmer and cook for 5 minutes. Add the lemon zest and season with sea salt and freshly ground black pepper to taste. Char grill the sliced eggplant and zucchini slices. Cover the base of each ramekin with potato then add a few spoons of meat sauce. Lay the eggplant slices on top and spoon over a little more sauce. Put the zucchini slices on top then cover with remaining sauce. Set the ramekins aside. Melt the butter then add the flour. Cook stirring continuously for 3-4 minutes or until he flour smells toasty. Slowly add the milk and stock stirring continuously. Keep stirring until the sauce has thickened and comes to the boil. Cook for a couple of minutes then stir in the nutmeg, parmesan cheese and seasonings to taste. Alternatively the moussaka can be baked immediately after it’s prepared then chilled and gently heated in the microwave when needed. Great recipe, Sandra. Absolutely love moussaka and, like you, we are also heading into the colder months in NZ so comfy and warming food is just the ticket. Delicious. Moussaka is a great idea — I haven’t had it in years and years. I can see how you would especially like it in your cooling fall weather now; since we are at the opposite end of the earth, we’ll have to wait a couple of seasons for it to be most appealing. Great post – thank you for reminding me how much I love Moussaka. Nothing better in winter than a good Moussaka. this one looks delicious. I think I could safely say they will, enjoy…. My better half is similarly inclined. That is she is not inclined towards the kitchen at all. That facilitates my cookery and allows me experiment as much as I like. Lovely moussaka too. I must try one. No complaints from me about the non-cook. Thankfully his pockets are deep enough to treat me to great nights off. I sure you could create THE perfect moussaka. Beautiful. One of my favorite hearty dishes. And I just love cinnamon in tomato sauce! Looks and sounds delicious, Sandra. I ate moussaka once years ago in a Cypriot monastery (long story) which also had potato layered in. It was so good! Lamb Moussaka is truly a gift from the gods. Often cooked here and we’re always looking for different recipes. Your crust sounds excellent. Oh this is lovely Sandra… and just what we’ll be needing over the months to come. I’ve never made Moussaka before, but very much look forward to doing so! I love your honesty about your husband’s interest in cooking. The truth is the truth. Yup, I’ll be putting eggplants on the shopping list again. Do you think I could substitute cornflour for the béchamel, I’m not allowed wheat flour (yet)? Also, are your eggplant and zucchini slices horizontal, along the veg, or across, to make rounds? 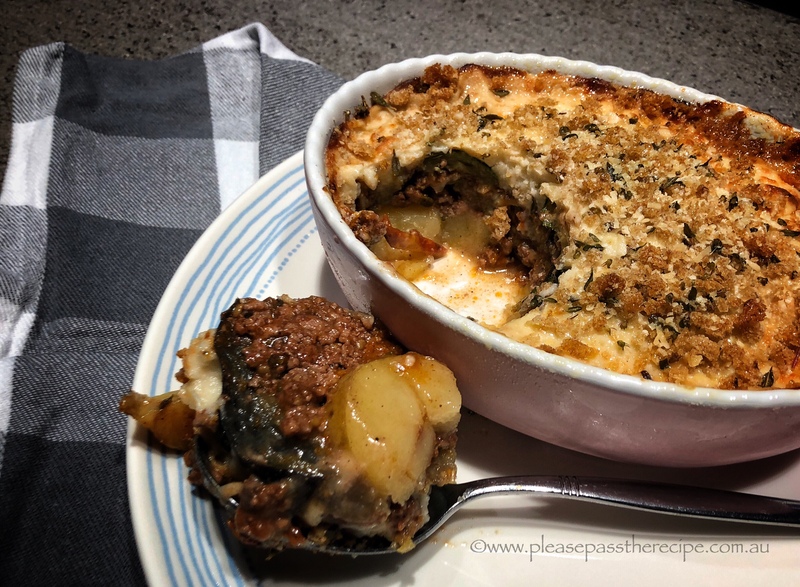 This entry was posted on May 24, 2018 by ladyredspecs in Cooking, FODMAP diet, Food, Lamb, Main Meals, recipes and tagged béchamel, casserole, dinner, do-ahead, eggplants, FODMAP diet, Greek food, lamb, lamb moussaka, moussaka, zucchini.